The five states with the highest average combined state-local sales tax rates are Tennessee (9.45 percent), Arkansas (9.24 percent), Louisiana (8.91 percent), Washington (8.88 percent), and Alabama (8.85 percent). Sales taxes rates differ by state, but sales tax bases also impact how much revenue is collected from a tax and how the tax effects the economy. The District of Columbia successfully expanded its sales tax to include some services, which allowed reductions in its individual and corporate income tax rates. The five states with the highest average combined rates are Tennessee (9.45 percent), Arkansas (9.24 percent), Louisiana (8.91 percent), Washington (8.88 percent), and Alabama (8.85 percent). The lowest non-zero state-level sales tax is in Colorado, with a rate of 2.9 percent. Seven states follow with 4 percent: Alabama, Georgia, Hawaii, Louisiana, New York, South Dakota, and Wyoming. No changes to state-level sales taxes took effect in the first half of 2014. However, Rhode Island considered eliminating its 7 percent sales tax in 2013 and revisited the idea in January of 2014. Had the proposal passed, Rhode Island would have become the first state ever to repeal its statewide sales tax. On October 1, 2013, the District of Columbia lowered its sales tax from 6 percent to 5.75 percent. In May of 2014, the D.C. Tax Revision Commission suggested raising this rate back up to 6 percent as a part of its comprehensive set of recommendations to the D.C. Council, which also included rate cuts in other parts of the tax code. The Council decided against the sales tax rate increase, however, keeping Washington D.C.’s sales tax rate below the rates in neighboring Northern Virginia and Maryland and instead broadening the sales tax base slightly. This base expansion partially offset decreases in individual and corporate income tax rates. On August 5, 2014, Missouri voters rejected an increase of 0.75 percent to their state sales tax. The increase would have lasted for ten years and would have frozen the state’s gas tax at its current rate over the same period. The five states with the highest average local sales tax rates are Louisiana (4.91 percent), Alabama (4.85 percent), Colorado (4.51 percent), New York (4.48 percent), and Oklahoma (4.26 percent). At the beginning of 2014, Mississippi had the lowest non-zero average local rate of 0.004 percent, attributable to the state’s only local sales tax at the time: a 0.25 percent sales tax in the city of Tupelo. However, in a referendum on the local January 2014 ballot, residents of Jackson approved a 1 percent city-wide “special sales tax.” The new tax took effect in the state capital on March 1, 2014, raising Mississippi’s average local rate to 0.07 percent. Idaho now has the lowest non-zero average local rate of 0.03 percent, with only a handful of cities and counties levying a local sales tax on top of the statewide rate of 6 percent. Many cities and counties in Kansas have introduced or increased local sales taxes this year, bringing the state from 12th to 9th in the ranking of states with the highest combined state-local rates in the period since January 1, 2014. In November of 2014, residents of the state’s largest city, Wichita, will vote on whether or not to approve a five-year, 1 percent citywide sales tax that would bankroll a bus route expansion and a “jobs development fund.” Two other cities in the Wichita metro area (Goddard and Mulvane) are also voting on new sales taxes of their own this fall. 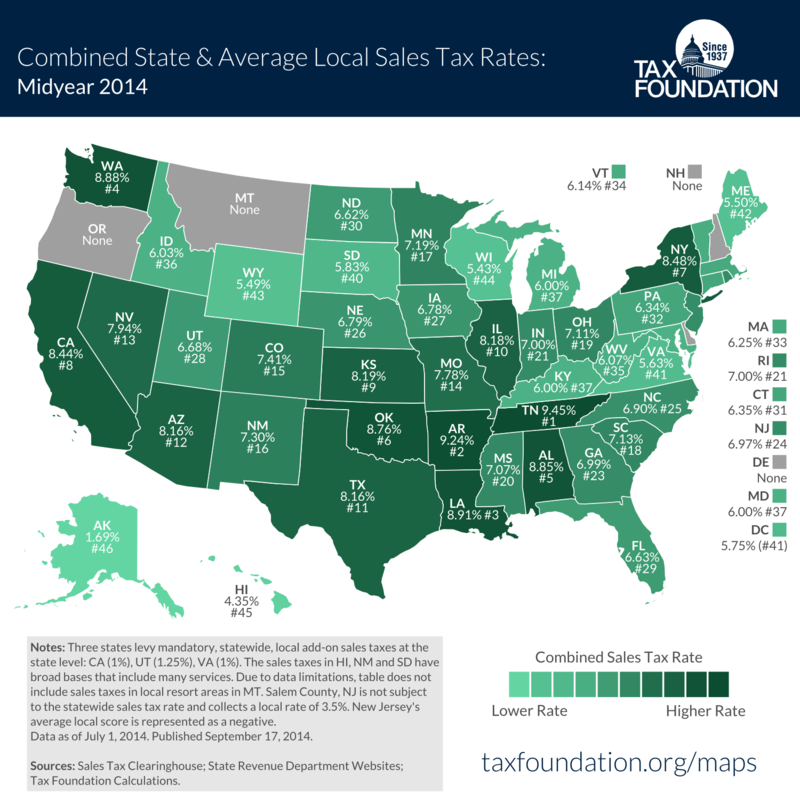 Only four states saw a net decrease in their average local sales tax rates in the first half of 2014: Georgia, New York, North Dakota, and Wyoming. The largest decrease was in North Dakota, where the average local sales tax rate dropped 0.06 percent from January 1 to July 1, 2014. The highest local rates are in Homer and Seldovia, Alaska (7.5 percent); Tuba City, Arizona (7.125 percent); Snowmass Village, Colorado (7.1 percent); Seward, Alaska (7 percent); Brookwood and Toxey, Alabama (7 percent); and Lake Providence, Bernice, and Farmerville, Louisiana (7 percent). The state of Delaware actually uses its state border welcome sign to remind motorists that Delaware is the "Home of Tax-Free Shopping." State and local governments should be cautious about raising rates too high relative to their neighbors because doing so will amount to less revenue than expected or, in extreme cases, revenue losses despite the higher tax rate. Hawaii has the broadest sales tax in the United States, but it taxes many products multiple times and, by one estimate, ultimately taxes 99.21 percent of the state's personal income. This base is far wider than the national median, where the sales tax base applies to 34.46 percent of personal income. In July of 2014, councilmembers in the District of Columbia voted to expand D.C.’s sales tax base to include previously untaxed services such as car washes, carpet cleaning, and bowling alleys. The expansion also brought fitness services under the sales tax umbrella, prompting health clubs and training studios to misleadingly label the measure a ‘fitness tax’ or ‘yoga tax,’ rather than simply the elimination of a pre-existing carve-out for the fitness industry. As of this year, 22 states include fitness services in their sales tax bases. Sales taxes are just one part of an overall tax structure and should be considered in context. For example, Washington State has high sales taxes but no income tax; Oregon has no sales tax but high income taxes. While many factors influence business location and investment decisions, sales taxes are something within policymakers' control that can have immediate impacts. (b) Three states levy mandatory, statewide, local add-on sales taxes: California (1%), Utah (1.25%), Virginia (1%). We include these in their state sales tax. (e) Salem County is not subject to the statewide sales tax rate and collects a local rate of 3.5%. New Jersey's average local score is represented as a negative. Joseph Henchman, Testimony before the Rhode Island Special Joint Legislative Commission to Study the Sales Tax Repeal, Nov. 21, 2013, https://taxfoundation.org/article/testimony-rhode-island-special-joint-legislative-commission-study-sales-tax-repeal. DC Tax Revision Commission, Recommendations: Final Report 2014, http://media.wix.com/ugd/ddda66_b54af5563fa54a17af9b41fc06aa672f.pdf. Joseph Henchman, D.C. Council to Vote on Tax Reform Package Today, Tax Foundation Tax Policy Blog, June 24, 2014, https://taxfoundation.org/blog/dc-council-vote-tax-reform-package-today. Jason Hancock, Missouri transportation sales tax defeated, KANSAS CITY STAR, Aug. 5, 2014, http://www.kansascity.com/news/government-politics/article1101536.html. Brian Eason, 9 in 10 Jackson, Miss., voters approve 1% sales tax, USA TODAY, Jan. 15, 2014, http://www.usatoday.com/story/news/politics/2014/01/15/jackson-ms-sales-tax-vote/4489851/. Idaho State Tax Commission, Local Sales Tax, http://tax.idaho.gov/i-1117.cfm. Kelsey Ryan, City Council votes to place proposed sales tax on November ballot, WICHITA EAGLE, Aug. 5, 2014, http://www.kansas.com/2014/08/05/3582950/city-council-votes-to-place-proposed.html. Bill Wilson, Wichita among few Kansas cities without a local sales tax, WICHITA BUSINESS JOURNAL, Jul. 1, 2014, http://www.bizjournals.com/wichita/blog/2014/07/wichita-among-few-kansas-cities-without-a-local.html?page=all. Art Woolf, The Unintended Consequences of Public Policy Choices: The Connecticut River Valley Economy as a Case Study, Northern Economic Consulting, November 2010, http://vtdigger.org/vtdNewsMachine/wp-content/uploads/2011/02/20101101_woolfArtUnintended.pdf. Justin M. Ross, A Primer on State and Local Tax Policy: Trade-Offs Among Tax Instruments, Mercatus Center at George Mason University, (Feb. 25, 2014). http://mercatus.org/publication/primer-state-and-local-tax-policy-trade-offs-among-tax-instruments. 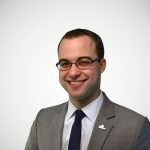 Joseph Henchman, Vida Fitness Spreads Half-Truths about DC Tax Cut Bill, Tax Foundation Tax Policy Blog, May 30, 2014, https://taxfoundation.org/blog/vida-fitness-spreads-half-truths-about-dc-tax-cut-bill. Nicole Kaeding, The D.C. ‘Fitness Tax’ in Context, CATO AT LIBERTY, Jun. 13, 2014, http://www.cato.org/blog/dc-fitness-tax-context.